Training for the Grand Canyon portion of the AZTR750 is unlike anything I've ever done before. 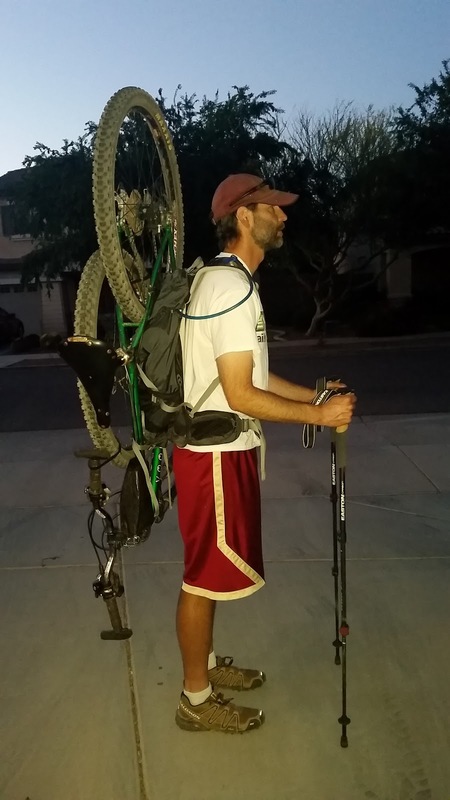 It's bound to get plenty of strange looks as I hike the local urban trail systems with a bike strapped to my back! Here are some photos from my intitial hike-with-bike K and I did on Christmas day over at the San Tan Regional Park on the Dynamite trail. It was a 3 1/2 mile roundtrip effort that, for the most part, felt really good. There was a bit of a bobbing effect on the lower end, so I'll look to secure that somehow. Perhaps the added weight will also help with this. 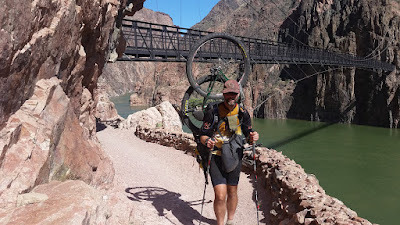 I'll also need to beef up the shoulder padding, the 21 miles of the Grand Canyon will be unrelenting for sure. 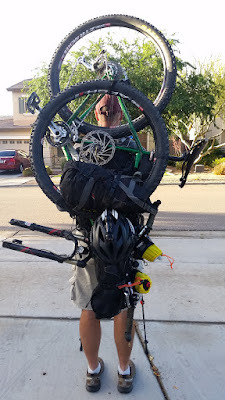 I'll add to this post as the training goes along, showing pics of the bike with more & more gear. I removed the drive side pedal, both wheels & chain to get started. 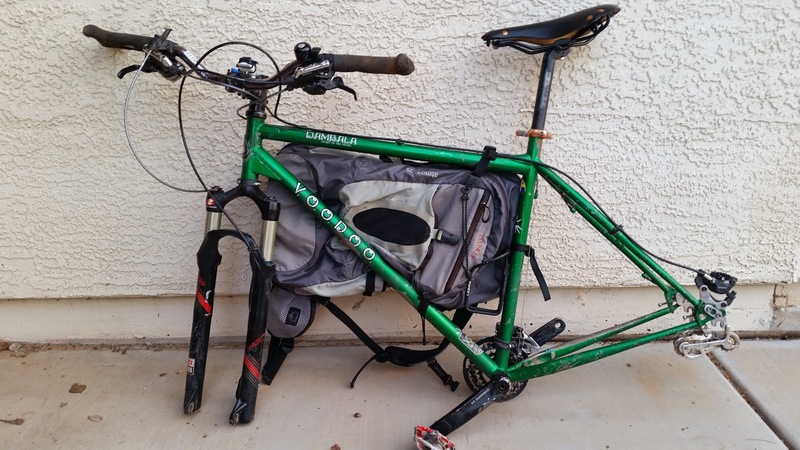 Pack only strapped to the frame, back end of the bike will be UP. Pack only from the opposite side. 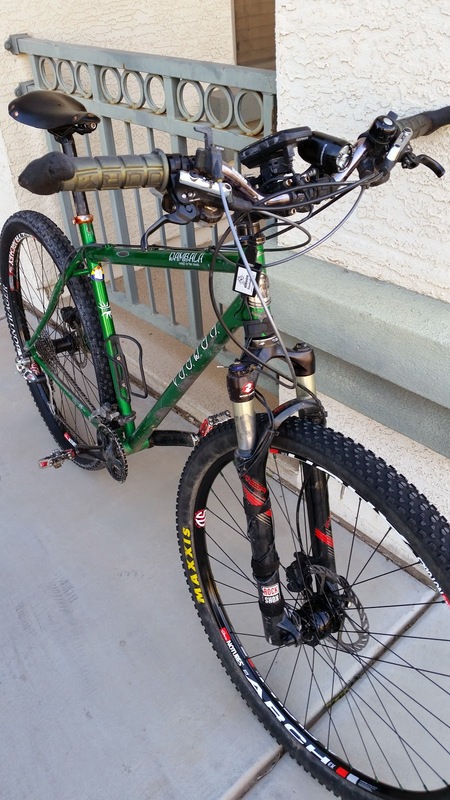 There are 3 attach points, one tiedown on the seatpost tube and I was able to use both strap clips from the Osprey to secure the toptube & downtube. Next, I ran a shoelace through both bubs to keep all the tiny bits in place. Here is the final assembly with both tires, again anchored in 3 places with ties and velcro. Notice how the pedal is secured to keep the cranks steady. Opposite side of the final, NO GEAR, assembly. The Osprey is empty as well for this. An empty setup is about 30 lbs, I'm curious to see what the final loaded setup will be. 55? 60? I'll probably mail a few things home from the South Rim to help lighten the load. I'm hoping for only one cold night out after I start hiking down. Testing out the goods on the maiden voyage. An older pic showing the two mounting brackets I was using. The one on the stem is a little difficult to see. 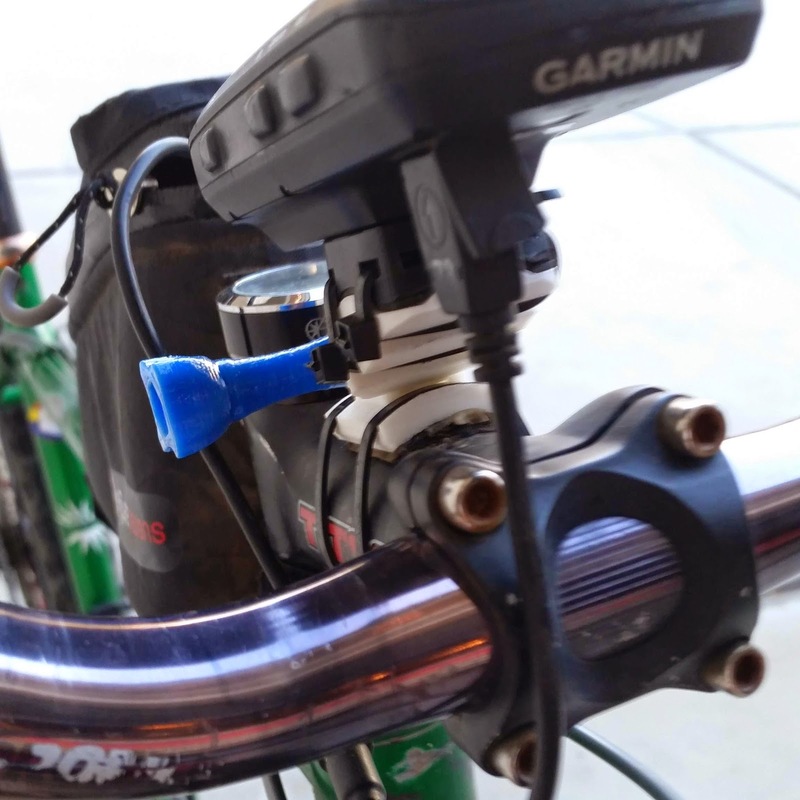 Now there's ample space for the charging plug when mounted over the stem. 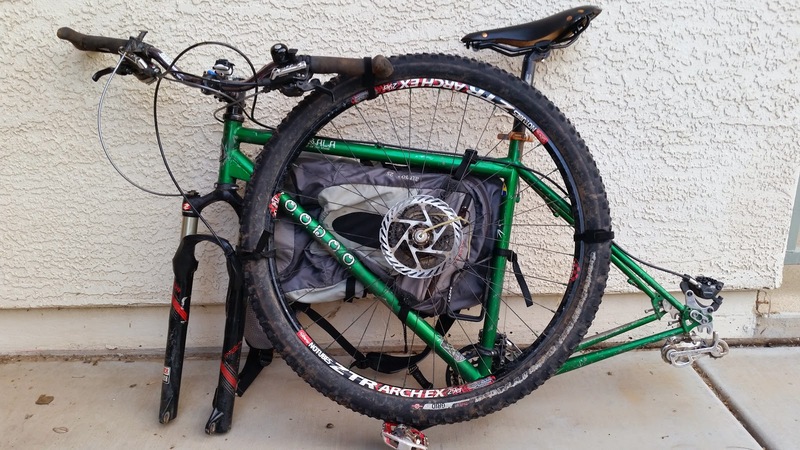 External charger is in the Revelate gastank. A few test runs have proved successful!! My current project is to build up a front wheel around a Schmidt Son28 dynamo hub. 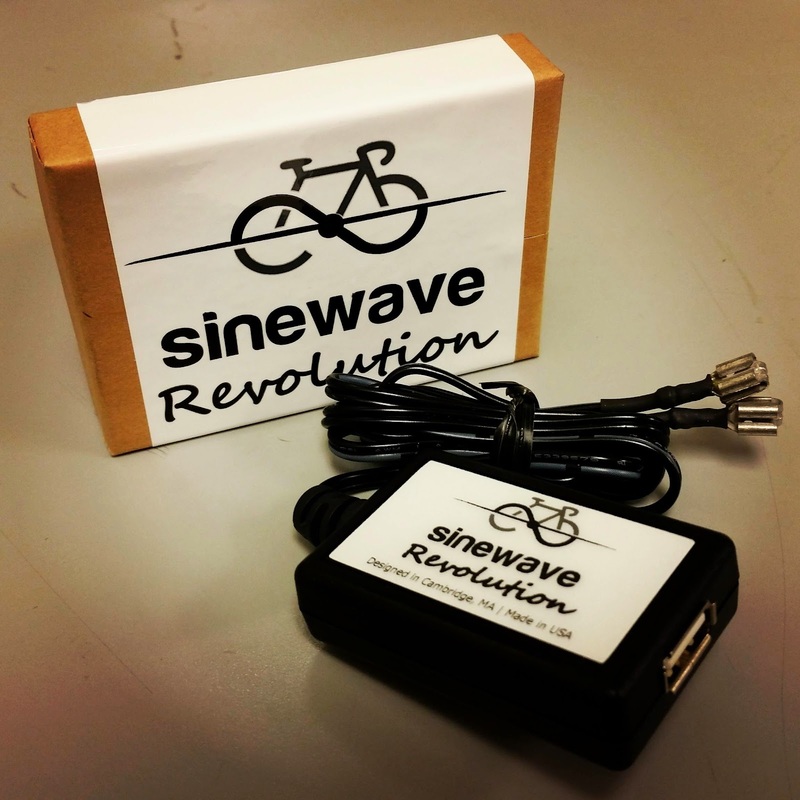 This will allow me to power my lights & GPS by simply pedaling!! How cool is that? Less batteries to carry and worry about. 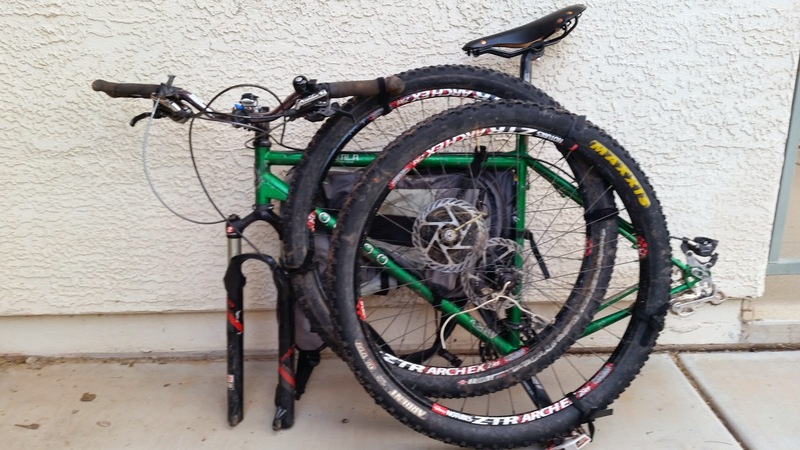 I'm hoping to have the wheel ready to go for a mid-Feb. bikepacking ride. 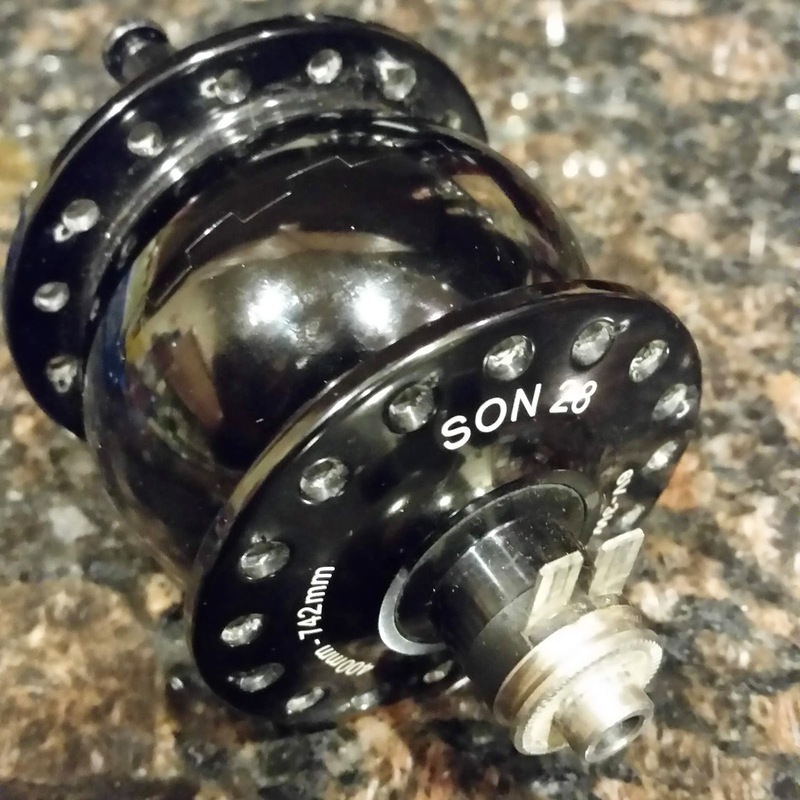 The Son28 dynamo hub. Power connectors are front & center. Next up was a USB converter, allowing me to power any device capable of being charged via USB port. I went with the Sinewave Revolution based on plenty of favorable online reviews. Very compact design. Keep it simple. 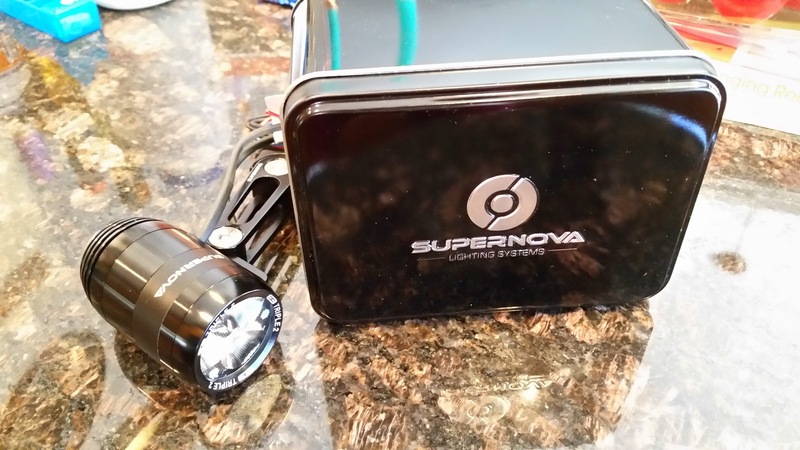 For my lighting needs I went with the Supernova E3 Triple2 LEDs. My plan was to use a piggyback connector on the lights for the USB converter allowing both lights & USB device to be powered simultaneously. It even comes in a cool tin. One of my co-workers was kind enough to give my connectors a professional appearance. I was ready to test it out! 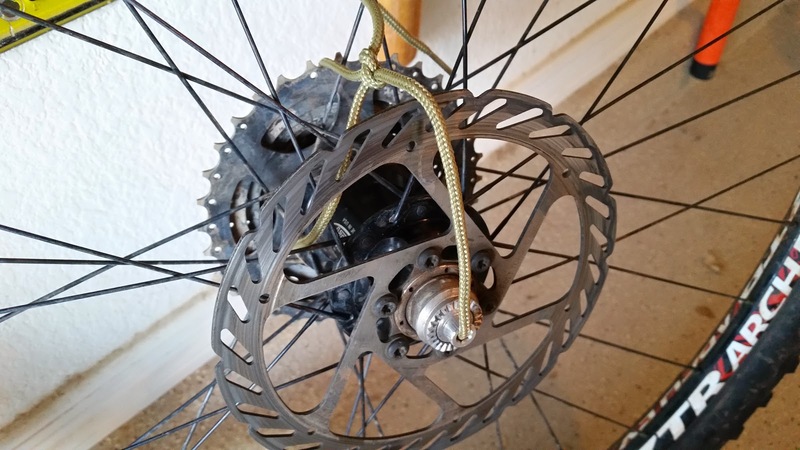 Dynamo wheel, USB converter, light, GPS, etc. That's a high tech cockpit!! I was able to get my dynamo hub built into a functional wheel!! I was itching to give it a whirl. Luckily for me, I had a 4 day bikepacking loop locked & loaded ready for a shakedown. The lights come on instantly, huge bonus. Not only that, but they come on with enough light at HAB speed!! This was a major surprise & bonus. No need to whittle down my helmet batteries for HAB in the dark. 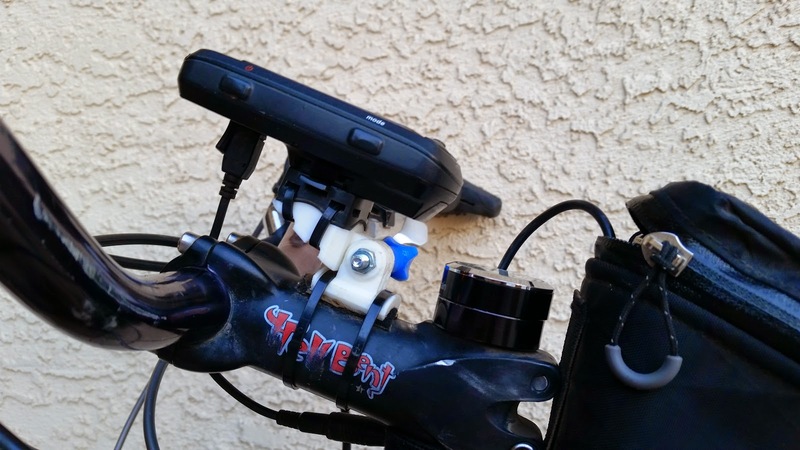 The GPS was powered by the hub at speeds above 4.5 mph. I thought this was pretty good considering the 29" wheels. The constant beeping of the GPS every time 'external power lost' became annoying rather quickly. This was an easy fix, turn off the chime. I just have to pay more attention to the route, since I won't hear a warning signal when/if I go 'off route'. There is a 10 second delay when the GPS goes from internal battery power to external 'hub' power. Not a big deal, but during nighttime riding this means the backlight won't be illuminated until the external power kicks in. Very minor IMO. After 4 days of riding 12+ hour days each day, the GPS never dropped below 100% charge. Major WIN!! I did take a rough crash on the final day of our ride. 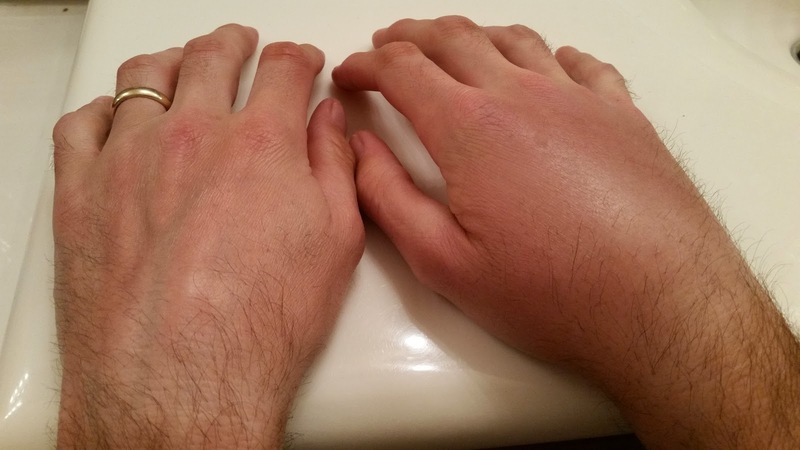 My right hand ballooned up, x-rays were negative. Wrist continues to be sore. Left hand was met full thrust by a hedgehog cactus!! 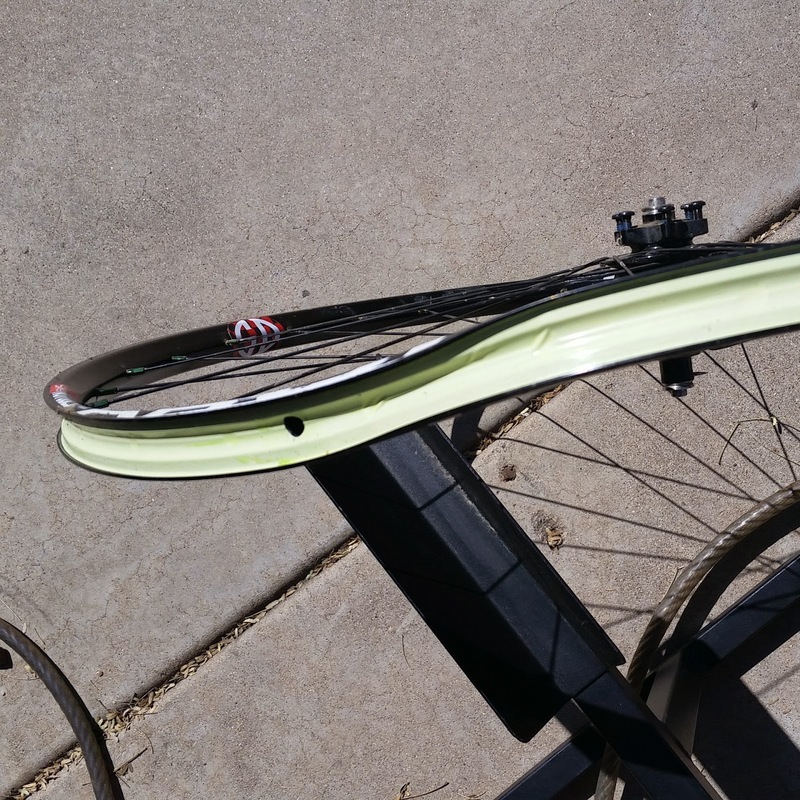 Last week I was rear ended on my way to work, bike on the hatchback rack and took the hit. Ack!! Yep, that was my newly minted dynamo wheel!! 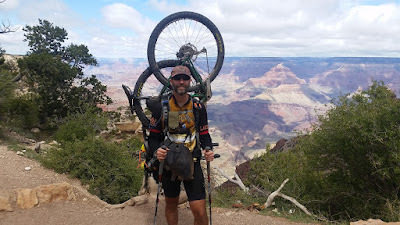 While I wait for final word on the bike and get a new front wheel, I went out and tested a different method for the Grand Canyon portage. This time I left the rear wheel & chain attached. Quicker setup and felt better on my shoulders. Just need to be aware of the added height. My wrist was still bugging me, but I was able to do a nice 25 mile ride last weekend up on the tame trails of Brown's Ranch. I needed a realistic test before the race as launch date was fast approaching. I put together an overnight ride out in Gila River Canyon country. 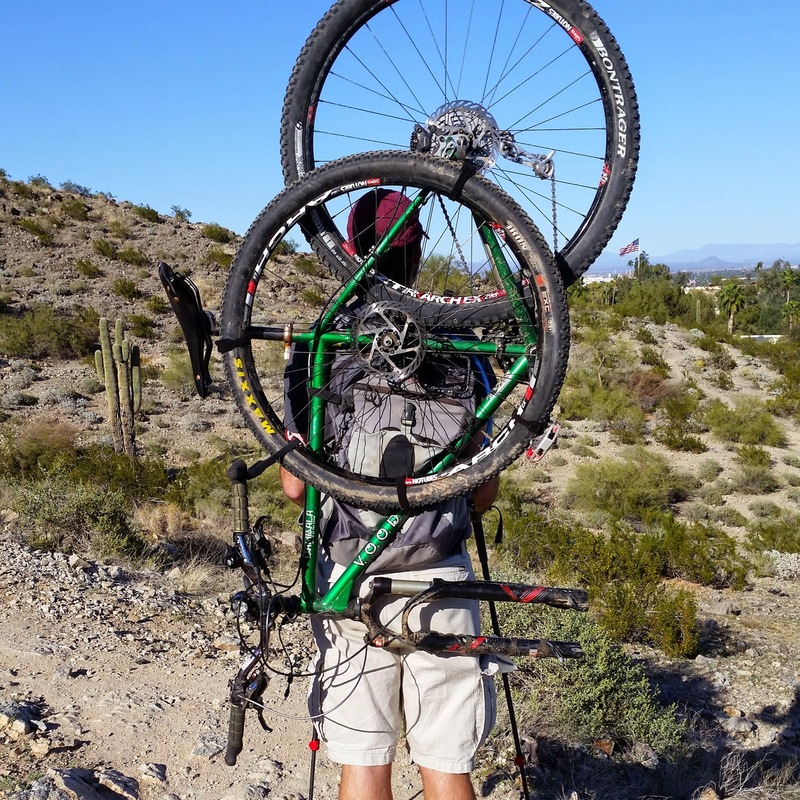 We'd be riding some rugged terrain on the AZT, the final 46 miles of the 300 course to be exact. It didn't take too long before my worst concerns were realized. My wrist just wasn't up to the constant barrage of rock hits and extended breaking. I iced it down at camp that night, but kinda knew what was coming. We rode back the car the next day and by the end I knew it was over. No AZTR750 this year. I'm really bummed out, but the decision is the correct one and the training and preparation I've put in for this year can be transferred to 2016 when I fully intend to line up for the 750. My wrist ended up being fractured, a second x-ray came back positive when the healing became more visible. By the fall I had been back on the bike for a while and again set my sights on the 750. I picked up a new pack so I didn't have to borrow Scott's again. I went with an Osprey Stratos 36. I bit on the large side, but I also wanted something to do overnight hikes with. It wasn't going to be a one trick pony. 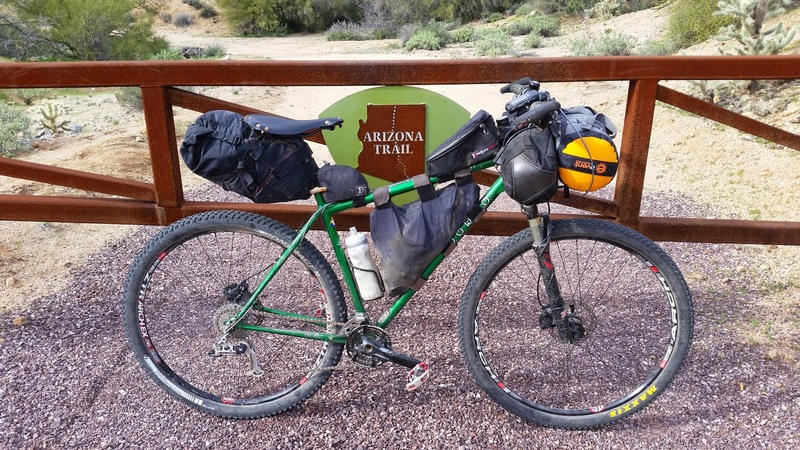 As the months ticked down I began to have different thoughts about using the post office at the South Rim. By my estimation I was looking at a weekend arrival and really didn't want to get stuck there waiting an extra day for it to open, so how could this be avoided? Ride faster or slower for sure. I took the big pack out for a day ride and was surprised how well it felt. 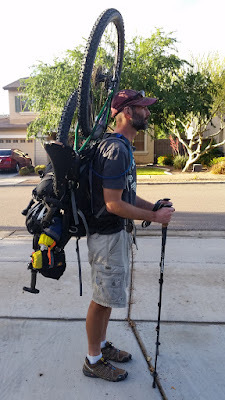 This got me thinking that maybe I should just do the whole thing with the big pack, switch to flat pedals & hiking shoes and affix trekking poles to the pack. 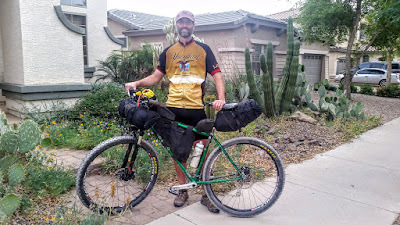 So, about a month out from the race I went to Sedona for the BFL to give it all a test ride. It went great, well, except for my cranks which broke about halfway through the ride. I kept the flat pedals on and was really surprised to see that I didn't notice much of a change in my riding style or performance. If anything, it was helping my feet with numbness issues. 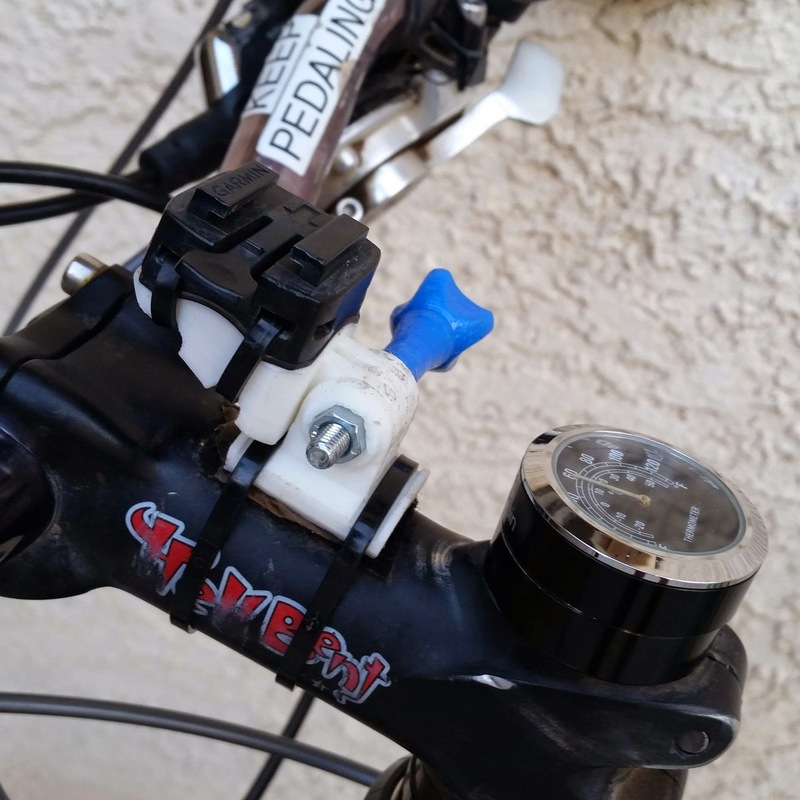 I also changed the location of my handlebar light and had another mount 3D printed so I could attach it on the crown of the fork. 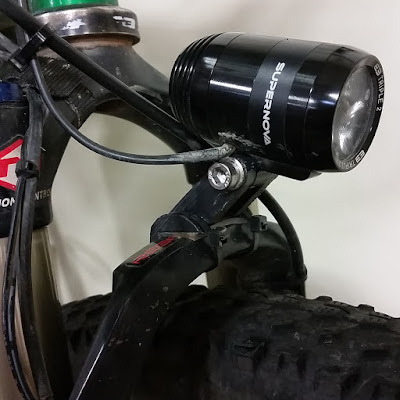 This has worked beautifully and now I just leave it on the bike 24/7. The tire only casts a small shadow, but it isn't in my line of sight. I began to tinker with my Canyon portage setup some more. 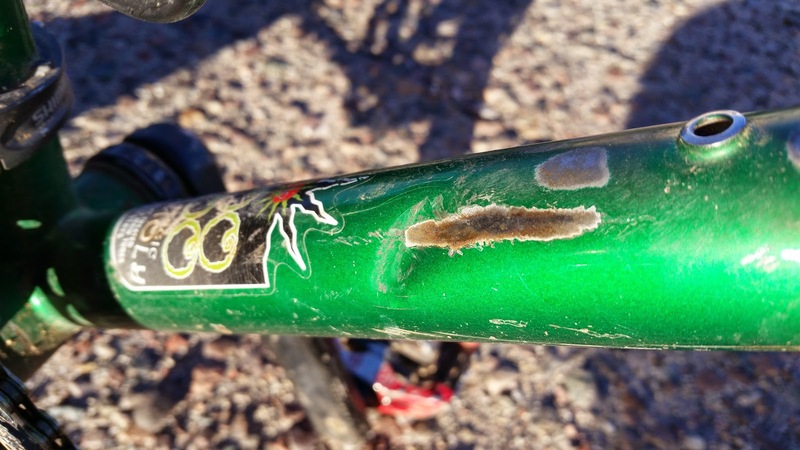 The first time I mounted the bike to the pack I had it a bit too low and the forks were hitting my calves when I walked. I had to get the bike higher. You can see in this photo the rig isn't quite mounted high enough causing the handlebars to hit my right leg. Here, only one pedal, framebag & front wheel are removed. Bike is attached to the Osprey pack using only the 6 supplied strap/buckle combos from the pack. 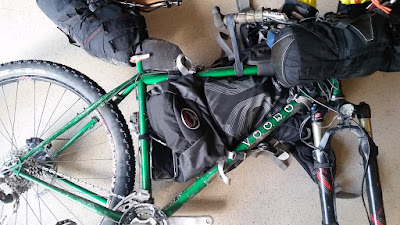 I used double-sided hook & loop velcro to steady the handlebars and when affixing the front wheel to the final setup. I also removed the seatbag after this photo was taken. I wanted to re-attach it more in the center of the load. 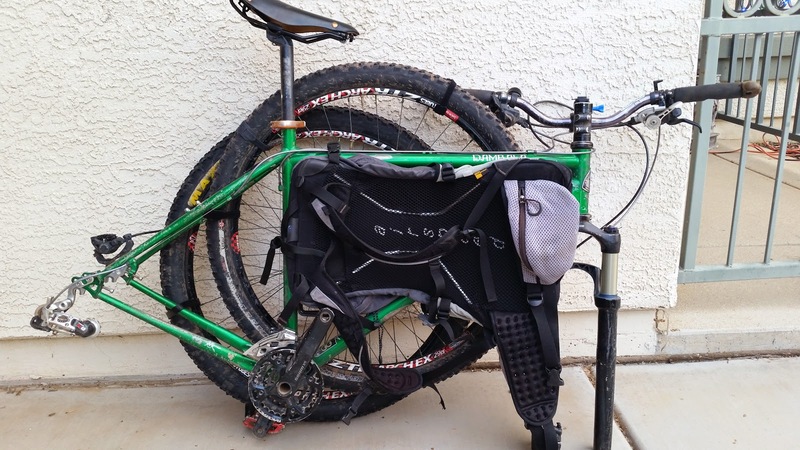 The framebag would be on my chest, tools swapped out for food & easy access while hiking. 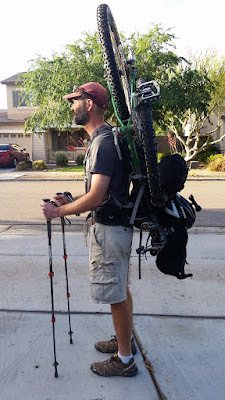 I ran a large strap around my torso to keep the framebag relatively steady for the hike. Below is the final setup I used from all four sides. Notice how far away the rig is from the back of my knees. This would be my setup at the border fence. I was finally ready to go!! 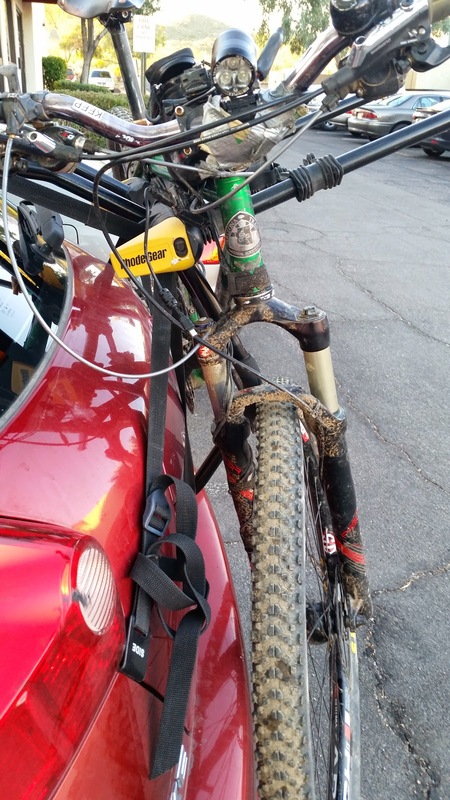 During the race I mounted the setup too low at the South Rim. As soon as I put the entire pack on and took one step I realized it, oops. So, I had to take it all apart and redo it. Luckily, it's a really quick process. Below are some snaps from my Grand Canyon portage. Make no mistake, it's tough. But it is manageable as long as you find some big rocks to sit back on. This allows the fork to rest on the rock and removes the pressure from your shoulders - such relief!! There are plenty of big rocks in the Canyon!! 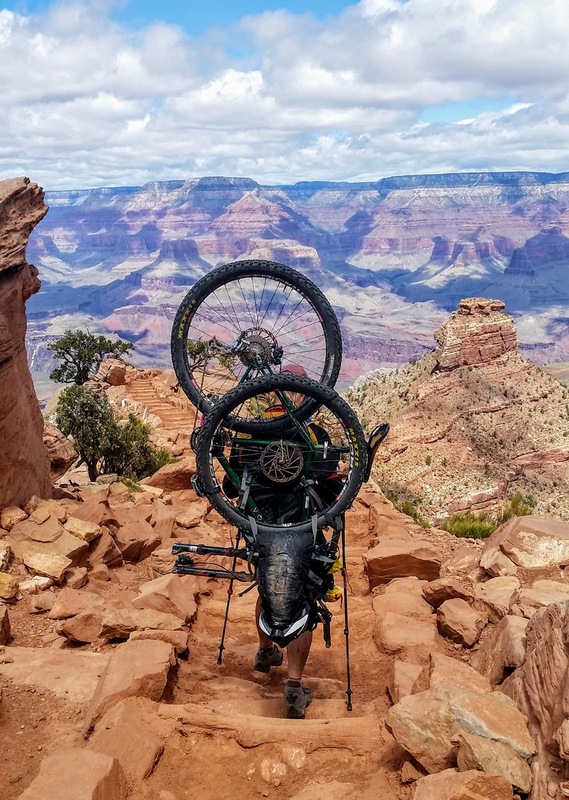 This is why you need the leg clearance, hundreds & hundreds of waterbar stepdowns on the S. Kaibab trail. 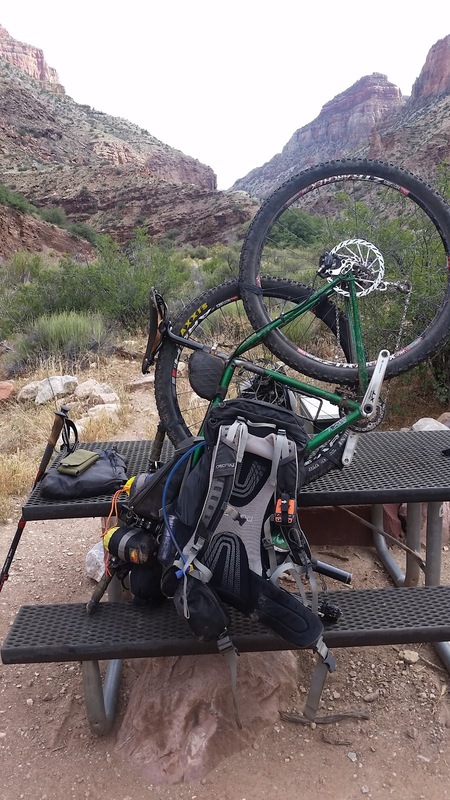 If you have to take the pack off, be sure it's somewhere you can elevate it when putting it back on. 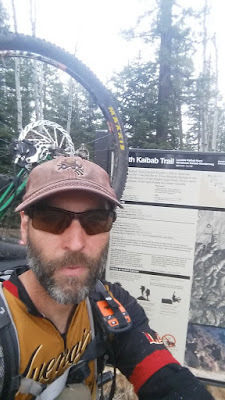 I made the mistake at the first restroom on the S. Kaibab trail and almost fell over trying to stand up. 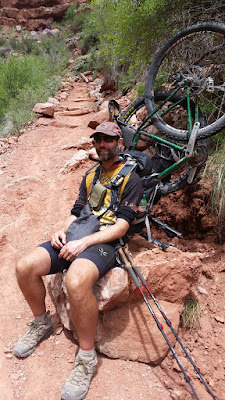 One of many rest breaks. 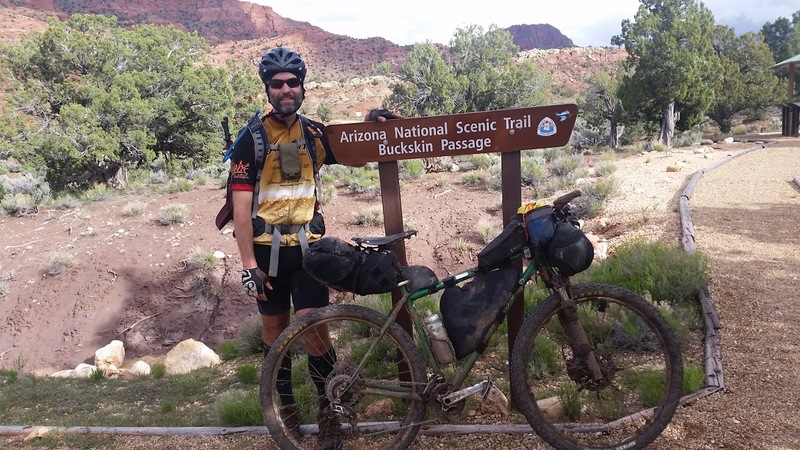 Here on the N. Kaibab trail. It felt so good to lean back like this, but I tried to keep my breaks short. Maybe 5 minutes. I was good for 15-20 minutes of hiking before I began looking for large rocks to rest on. Exhausted, but super stoked to see this sign!! 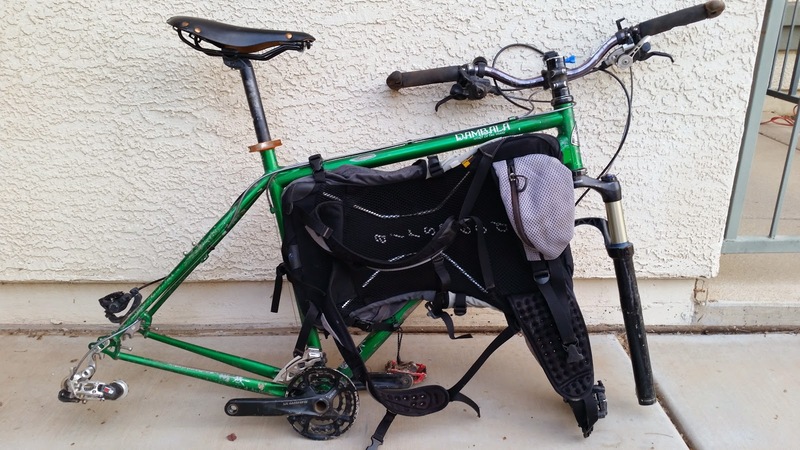 It wasn't until I disassembled the pack and was ready to ride again that I realized my legs were virtually useless in walking mode. Done. 13 Days, 9 Hours & 44 Minutes. Full recap can be viewed here. It's long, but there are a ton of pics and some interesting happenings along the way. Thanks for checking it out. Best of luck to anyone who lines up for the 750. It's a life altering event. I'm already looking forward to another attempt in the upcoming years. I turned my elevation cue sheets into digital form. They are available as posters, stickers & mugs. They are great motivational tools or wall art for the bike den. 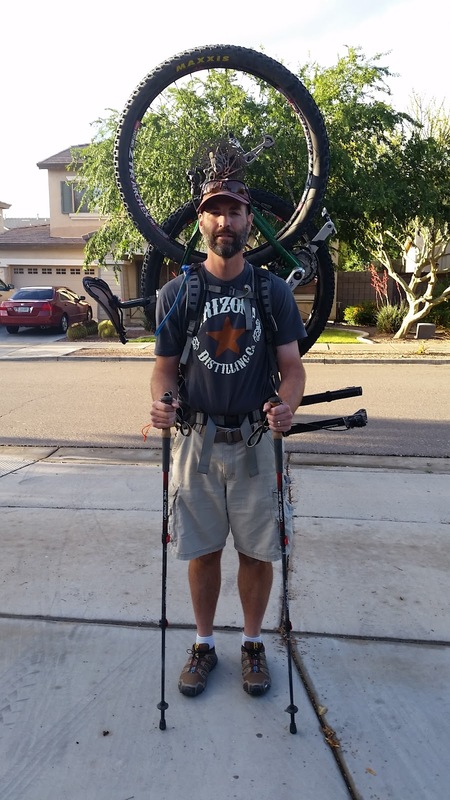 I have both the AZT300 & 750 available as well as a few other ultra endurance events. Links below. Thanks for looking. Digital downloads are also available via Plasso, please read the file description. These are great for screensavers. I made a couple of t-shirts as well, those along with logo'd stickers & mugs can be found on my Zazzle account. *Please note, t-shirts are available in all sorts of fabric and may have custom text added at no charge. For example: 2018 Finisher!! The tees have different graphics on the front/back of the shirts, be sure to check out the previews. Available in sticker form & mugs for the 750 & 300. Back of the 750 t-shirt, from graphic is the logo from the mug pictured above. I consider the 300 as rational, but the 750 as irrational. However, the more I think about it, especially with folks like you virtually twisting my arm, why not! I've been following that thread!! I'm curious why you feel the 750 is irrational over the 300? 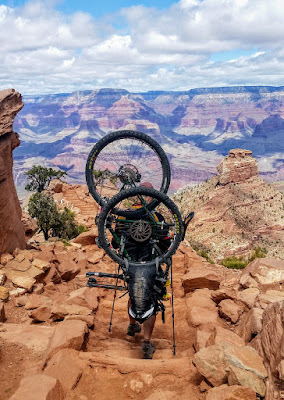 I've essentially pre-rode the entire 750 route and feel the miles after Picketpost are generally faster, of course Highline & Grand Canyon are the exceptions. As long as I have my GPS topped off, I shouldn't need to re-charge it on the Highline, I'll have a cache battery for a boost on the Grand Canyon portage. If all goes well, I'll do the Highline during daylight & most of the Canyon as well. I'll use my hiking headlamp for the night hiking anyway. Thanks for chiming in, always an interesting to hear what you have to say. Cheers! John, thanks so much for the intel - hopefully it'll save me a load of iterations (though I know there will still be a remaining load to get through). Starting the experimentation with the bike setup for GC on 26th Dec, toeing the line at the Mexican border on 7th April 2017! The light-on-fork-crown is also intriguing - my 3D printer design pal has already been contacted! 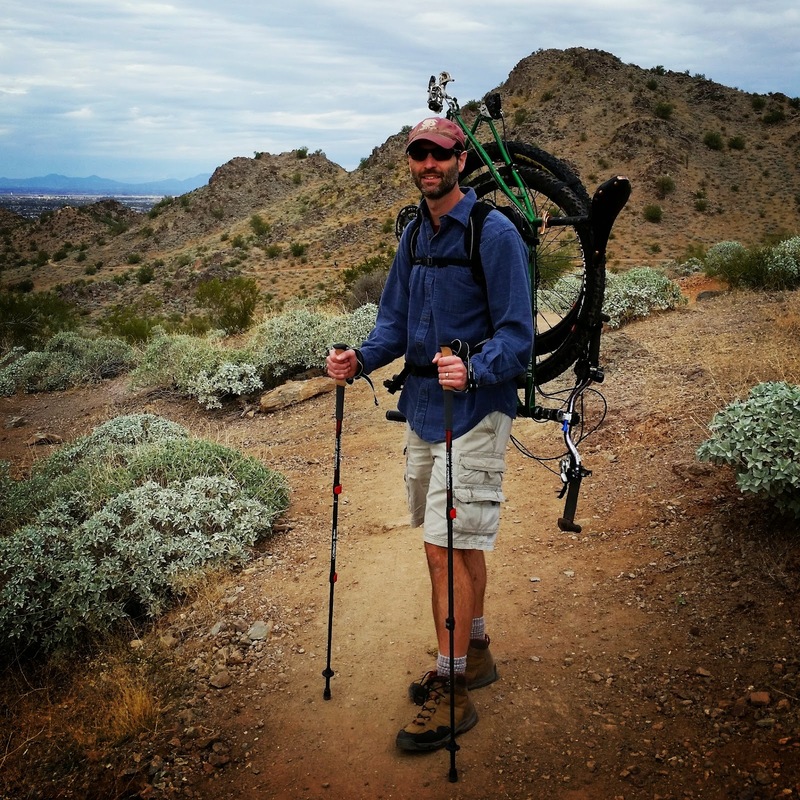 How was your experience on the Highline trail, the portion of the AZT 30 miles north of Pine into Pine? Hey Chuck, sorry, but I just now saw this comment!! Going northbound, the route I took picked up the AZT at Oak Spring. The trail is rugged and had a bunch of hike-a-bike into Pine. The 18 miles after Pine were a steady mix of hike-a-bike and riding, maybe 50/50 ratio. It's tough.